Soprano XL is the most advanced techonology in laser hair removal, providing for everyone, regardless of skin colour, the opportunity to experience the benefits of laser treatment for permanent hair reduction. 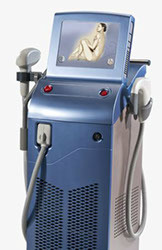 The massage or sweeping technique of the laser heats and destroys the targeted hair follicles with powerful pulses of laser energy which are felt as a warm sensation but which gradually build until all the targeted follicles are destroyed permanently and can no longer produce new hair. This is done with virtually no pain or discomfort as the laser is constantly rotating and in movement. Many patients have commented that this hair removal procedure feels like a “hot stone massage”. Soprano can be used in every part of the body including face, bikini-line, legs, arms and back and of course both male and female.